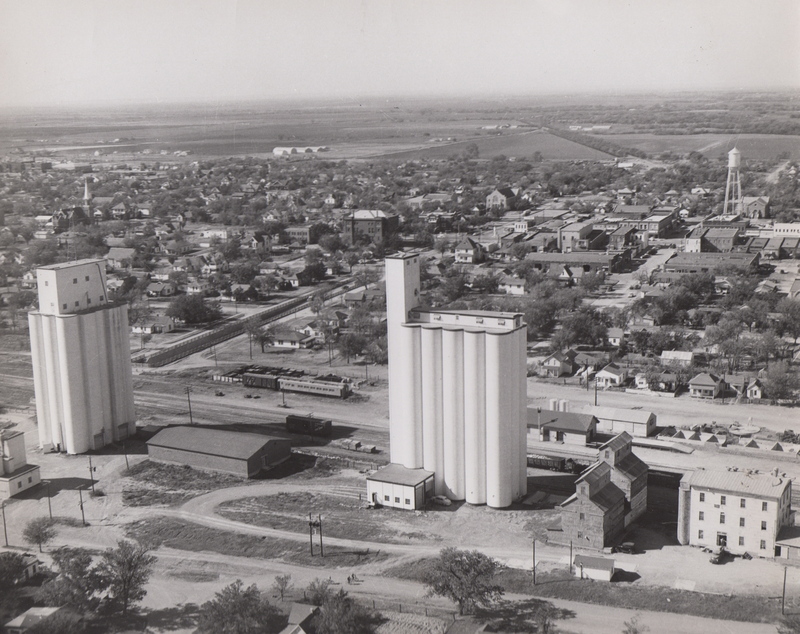 In 1946, Tillotson Construction Company, of Omaha, built a grain elevator in Kingfisher, Oklahoma. Kingfisher, a town of 4500 people, lies about forty-five miles northwest of Oklahoma City. Company plans list the reinforced concrete elevator’s capacity at 240,000 bushels. The elevator, seen on the left in the photo in a view from the northeast, was built on an expanded version of Tillotson’s standard Medford plan, with one leg. Two driveways pass through the center of the house. Storage was calculated at 2400 bushels of grain for each foot of height. A call to the elevator was answered by Linda in the office. She dug out a 50-year history of the co-op, published in 1984. The published history includes a 1955 “skyline view” photo that may be the same picture as above. Note the stained, north-facing, outer walls of the Tillotson elevator, indicating it had been in use for some time, while the elevator to the right is obviously brand new. The Tillotson elevator is presently known as the south elevator. The wooden buildings no longer exist at the site. In recent times, the Kingfisher Co-op Elevator first merged into a regional organization and is now part of a conglomerate. This entry was posted in Photography, Their Work, Tillotson Construction Company and tagged aerial photography, architecture, Business, construction, grain elevator, Kingfisher Oklahoma, photography, slip-formed concrete, Tillotson Construction. Thanks for sharing all the great photos and history! Is there a difference in the mechanical workings between the Tillotson round head house and a square head house? I might have missed it in an earlier post. I think the main difference is the ease of construction. We have some good information about how the rounded headhouse was found to be a better choice in many cases, and we will soon post more about it. Thanks for posing a very good question.